Unions are working people standing together. When working people stand together, we can bargain with our bosses for better pay, safer working conditions and decent benefits. When workers stand together, we have power. And that power makes the American Dream more possible for everyone. Have you ever had an idea on how to make your job and where you work better in some way? Throughout history, working people have stood together to have a voice where they work and a seat at the table to negotiate good wages and decent benefits for their families. This simple concept can apply to everyone, regardless of where you work or who your boss is. People who work for a living know about the inequality of power between employers and employees. 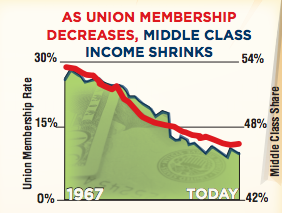 Workers want to form unions counter-balance the unchecked power of employers. With a union, working people win basic rights, like a say in their jobs, safety and security. Unions help remedy discrimination because union contracts ensure that all workers are treated fairly and equally. When there’s a problem on the job, workers and management can work together as equals to solve it. Through unions, workers win better wages, benefits and a voice on the job—and good union jobs mean stronger communities. Union workers earn 25 percent more than nonunion workers and are more likely to receive health care and pension benefits than those without a union. Unions continue to lead the fight today for better lives for working people, such as through expanded family and medical leave, improved safety and health protections, and fighting for fair-trade agreements that lift the standard of living for workers all over the world. Equal Pay Acts of 1963 & 2011 AND MORE! UNIONS ARE CONTINUING TO FIGHT EVERYDAY FOR WORKING FAMILIES SO WE ALL WIN!